We want to change the lives of Americans by ensuring access to educational opportunities. The simple fact is that educational attainment is the most assured route to an improved standard of living. Two-thirds of high-quality jobs will require education beyond the 12th grade by 2020, and post-high school attainment is THE key factor in finding a meaningful and fruitful career. Such a career ensures not only prosperity for the educated, but also for their families and children. We know that higher education attainment results in greater individual earning power. In fact, a worker with a bachelor's degree earns 84 percent more than a worker without a degree - an average value of $2.8 million over the course of a lifetime. And the value of individual attainment is also key to our national economic prosperity because research shows that more than two-thirds of all U.S. jobs will require a postsecondary degree or credential by 2018. By providing greater postsecondary access and success for all Americans, we build stronger economies, thriving communities, and a greater quality of life. It's clear that higher education remains the best avenue to prosperity, opportunity and a stronger nation. Each year, Lumina tracks the nation’s progress toward Goal 2025 focusing mainly on the percentage of the nation’s working-age population (ages 25-64) holding a two- or four-year college degree. According to the most recent available data (2012), 39.4 percent of these working-age Americans have a two- or four-year degree — an increase of 0.7 percent from last year’s reported rate of 38.7 percent. 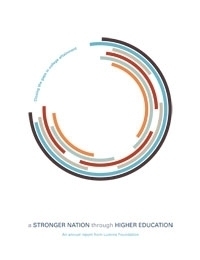 For detailed state-by-state data, including metro regions, see our yearly Goal 2025 progress report: A Stronger Nation Through Higher Education. A Stronger Nation offers detailed data arrays that describe degree attainment at the national, state and county levels. The report also provides degree-attainment data for each of the nation’s 100 most populous metropolitan regions. We hope that having all of this data available in this interactive format will assist you in your efforts to make Goal 2025 a reality.